An important Italian seaport on the Gulf of Genoa; also a former republic of the same name. It is very probable that even before the destruction of the Second Temple Jews from Rome settled in Genoa and took part in its commerce. 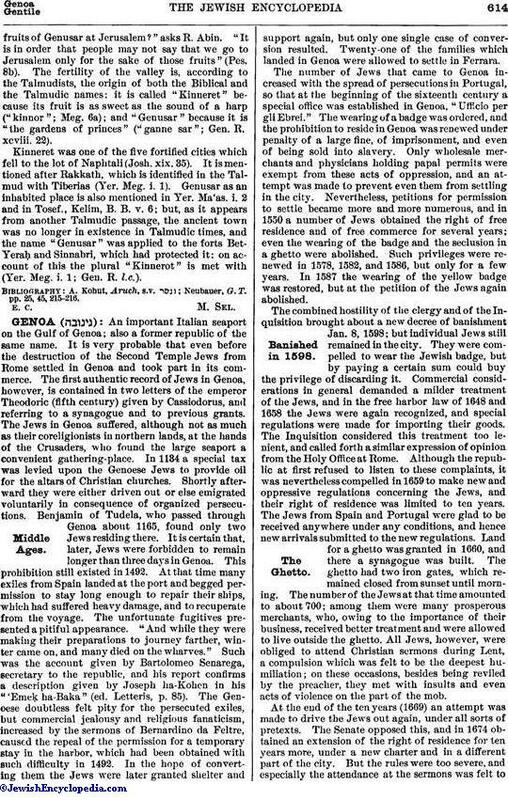 The first authentic record of Jews in Genoa, however, is contained in two letters of the emperor Theodoric (fifth century) given by Cassiodorus, and referring to a synagogue and to previous grants. The Jews in Genoa suffered, although not as much as their coreligionists in northern lands, at the hands of the Crusaders, who found the large seaport a convenient gathering-place. In 1134 a special tax was levied upon the Genoese Jews to provide oil for the altars of Christian churches. Shortly afterward they were either driven out or else emigrated voluntarily in consequence of organized persecutions. Benjamin of Tudela, who passed through Genoa about 1165, found only two Jews residing there. It is certain that, later, Jews were forbidden to remain longer than three days in Genoa. This prohibition still existed in 1492. At that time many exiles from Spain landed at the port and begged permission to stay long enough to repair their ships, which had suffered heavy damage, and to recuperate from the voyage. The unfortunate fugitives presented a pitiful appearance. "And while they were making their preparations to journey farther, winter came on, and many died on the wharves." Such was the account given by Bartolomeo Senarega, secretary to the republic, and his report confirms a description given by Joseph ha-Kohen in his "'Emeḳ ha-Baka" (ed. Letteris, p. 85). The Genoese doubtless felt pity for the persecuted exiles, but commercial jealousy and religious fanaticism, increased by the sermons of Bernardino da Feltre, caused the repeal of the permission for a temporary stay in the harbor, which had been obtained with such difficulty in 1492. In the hope of converting them the Jews were later granted shelter and support again, but only one single case of conversion resulted. Twenty-one of the families which landed in Genoa were allowed to settle in Ferrara. The number of Jews that came to Genoa increased with the spread of persecutions in Portugal, so that at the beginning of the sixteenth century a special office was established in Genoa, "Ufficio per gli Ebrei." The wearing of a badge was ordered, and the prohibition to reside in Genoa was renewed under penalty of a large fine, of imprisonment, and even of being sold into slavery. Only wholesale merchants and physicians holding papal permits were exempt from these acts of oppression, and an attempt was made to prevent even them from settling in the city. Nevertheless, petitions for permission to settle became more and more numerous, and in 1550 a number of Jews obtained the right of free residence and of free commerce for several years; even the wearing of the badge and the seclusion in a ghetto were abolished. Such privileges were renewed in 1578, 1582, and 1586, but only for a few years. In 1587 the wearing of the yellow badge was restored, but at the petition of the Jews again abolished. The combined hostility of the clergy and of the Inquisition brought about a new decree of banishment Jan. 8, 1598; but individual Jews still remained in the city. They were compelled to wear the Jewish badge, but by paying a certain sum could buy the privilege of discarding it. Commercial considerations in general demanded a milder treatment of the Jews, and in the free harbor law of 1648 and 1658 the Jews were again recognized, and special regulations were made for importing their goods. The Inquisition considered this treatment too lenient, and called forth a similar expression of opinion from the Holy Office at Rome. Although the republic at first refused to listen to these complaints, it was nevertheless compelled in 1659 to make new and oppressive regulations concerning the Jews, and their right of residence was limited to ten years. The Jews from Spain and Portugal were glad to be received anywhere under any conditions, and hence new arrivals submitted to the new regulations. Land for a ghetto was granted in 1660, and there a synagogue was built. The ghetto had two iron gates, which remained closed from sunset until morning. The number of the Jews at that time amounted to about 700; among them were many prosperous merchants, who, owing to the importance of their business, received better treatment and were allowed to live outside the ghetto. All Jews, however, were obliged to attend Christian sermons during Lent, a compulsion which was felt to be the deepest humiliation; on these occasions, besides being reviled by the preacher, they met with insults and even acts of violence on the part of the mob. At the end of the ten years (1669) an attempt was made to drive the Jews out again, under all sorts of pretexts. The Senate opposed this, and in 1674 obtained an extension of the right of residence for ten years more, under a new charter and in a different part of the city. But the rules were too severe, and especially the attendance at the sermons was felt tobe so degrading that the Jews rebelled, and in 1679 were all driven from the city. As before, Jews were later allowed to settle there again singly and only for a limited time. Even that privilege was abolished by a decree of banishment in 1752. However, only the poor were affected by the decree; the rich remained and were even favorably regarded on account of their acknowledged importance for the commerce of the republic. Through their influence a new charter was drawn up in 1752 upon fairly liberal terms, and the opposition of Pope Benedict XIV. remained without effect. The Senate at that time was very friendly to the Jews; it recognized the advantages they might bring to the city, the more so as it saw with regret how the neighboring port of Leghorn, where Jews enjoyed the most extensive liberties, was flourishing and injuring the commerce of Genoa. The Jews, however, had recognized the indecisive nature of this favor and kept at a distance from Genoa. Not until toward the end of the eighteenth century did they establish large commercial houses there. 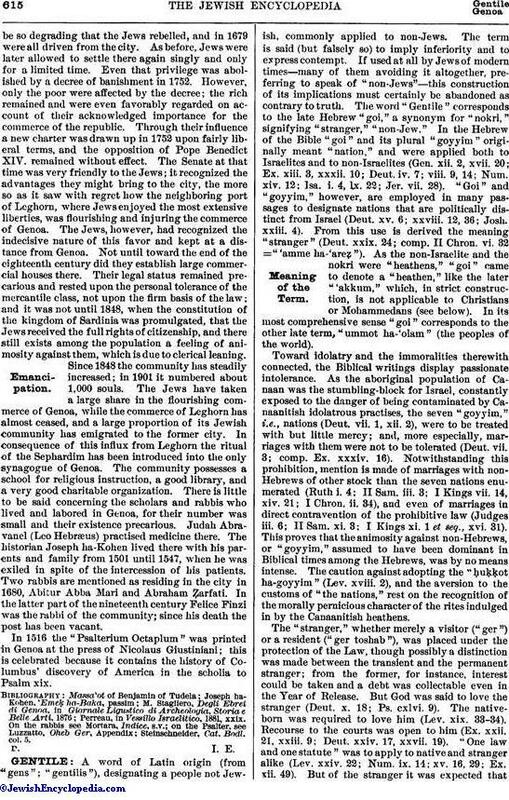 Their legal status remained precarious and rested upon the personal tolerance of the mercantile class, not upon the firm basis of the law; and it was not until 1848, when the constitution of the kingdom of Sardinia was promulgated, that the Jews received the full rights of citizenship, and there still exists among the population a feeling of animosity against them, which is due to clerical leaning. Since 1848 the community has steadily increased; in 1901 it numbered about 1,000 souls. The Jews have taken a large share in the flourishing commerce of Genoa, while the commerce of Leghorn has almost ceased, and a large proportion of its Jewish community has emigrated to the former city. In consequence of this influx from Leghorn the ritual of the Sephardim has been introduced into the only synagogue of Genoa. The community possesses a school for religious instruction, a good library, and a very good charitable organization. There is little to be said concerning the scholars and rabbis who lived and labored in Genoa, for their number was small and their existence precarious. Judah Abravanel (Leo Hebræus) practised medicine there. The historian Joseph ha-Kohen lived there with his parents and family from 1501 until 1547, when he was exiled in spite of the intercession of his patients. Two rabbis are mentioned as residing in the city in 1680, Abitur Abba Mari and Abraham Ẓarfati. In the latter part of the nineteenth century Felice Finzi was the rabbi of the community; since his death the post has been vacant. In 1516 the "Psalterium Octaplum" was printed in Genoa at the press of Nicolaus Giustiniani; this is celebrated because it contains the history of Columbus' discovery of America in the scholia to Psalm XiX. Steinschneider, Cat. Bodl. col. 5.